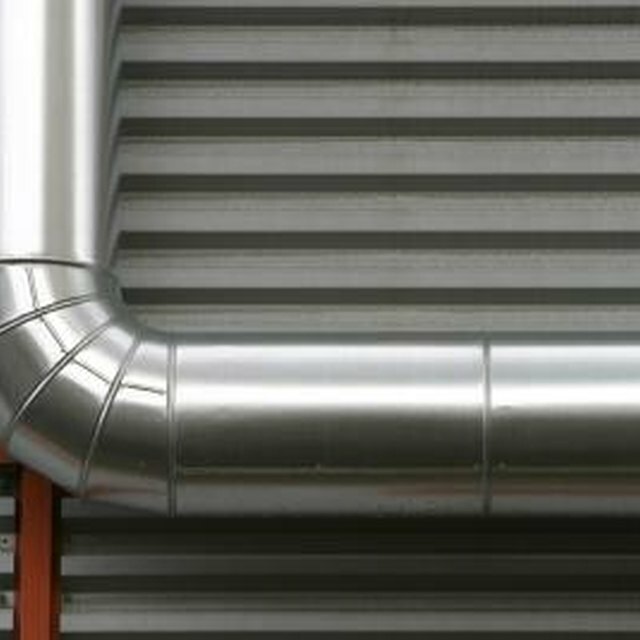 Crossover ducts are used in manufactured homes to carry both heated and cooled air from the main duct to the registers that are placed throughout the house. They are made of insulated flex duct that is fitted with a metal collar. The metal collar attaches the crossover duct to the main trunk duct, or rigid duct. Crossover duct work may run above the home through the attic or under the home through the crawlspace, which is most common. Determine how much flex duct you will need. To determine the length of flex duct you will need, consult any HVAC system documentation you may have for your home, including a sketch of the duct system design, which should detail the duct system size and length. If these are not available, contact a air conditioning specialist. Once you have measured the proper amount of flex duct, put on gloves and cut through the jacket and insulation with a knife or scissors. Use wire cutters to cut through the interior wire portion of the duct. Fold the jacket and insulation back about 2 or 3 inches. Place the collar on the flex duct and secure it to the main duct. When placing the collar onto the flex duct, make sure that at least 1 inch of the duct's core is inside the collar and past the bead. Slide the collar onto the main duct and screw it into place with at least three screws. Make sure the collar does not move or rotate. Seal the collar to the main duct with at least two wraps of mastic tape, pressing the tape tight to the core. Use a nylon or plastic cable tie as a clamp to permanently seal the collar and flex duct to the main duct. Replace and secure the insulation. Pull the insulation back up around the flex duct and main duct connection, and wrap it at least two times with duct tape and two more times with mastic tape. Secure the insulation to the main duct with a nylon or plastic cable tie. Place the head of a pan-head screw over the cable tie and screw it into the main duct so that the screw clamps the tie to the main duct -- repeat this at least two more times on other sides of the flex duct. Ensure maximum air flow. When stretching the flex duct from the main duct to the register boots, make sure the flex duct is stretched to its full length, leaving less than 5 percent excess duct. Give the flex duct at least 12 inches between junctions before bending it to prevent crimping. When making bends, keep them as loose as possible, and make sure the radius at the center line is at least one duct in diameter. Do not make bends around any objects, such as pipes or parts of the frame, or within 4 inches of hot equipment, such as furnaces, that are 250 degrees or hotter. Support flex ducts with support straps every 5 feet -- 6 feet if they are vertical -- so that they rest at least 4 inches off the ground. If this is not possible, check your state's mobile home installation laws. In any case, flex ducts may never rest on the ground. Connect the flex duct to the boot register in the same way you connected it to the main duct in steps 2, 3 and 4. Tiffany Nichols had poems published in 2007 in "Lights and Shadows," the University of North Alabama's literary magazine. She also writes for eHow and Answerbag. Nichols graduated from UNA in 2008 with a Bachelor of Arts in English.